Embroidery hoops and frames are generally thought of as necessary equipment. I recently got into a discussion with a lady on this. She’s been embroidering for all her life, and she works especially on vestments and altar linens for her church. So we’re talking advanced embroidery. She never uses a hoop or frame! She said she never learned on one, and never finds she needs one! The most commonly available hoops are probably the Susan Bates hoops found in most craft and hobby stores. These are plastic hoops with a “Super Grip Lip” on the inside ring, which is supposed to keep your fabric taut. These are very useful hoops – they are great for beginners and I use them all the time with the kids that I teach. They come in bright colors, so the kids really like them. Also, they’re affordable. If you aren’t sure you want to invest in this kind of hobby, you wouldn’t be putting out much in purchasing this hoop. They come in a variety of sizes, from I think 3 inches to about 8 inches. Better hoops: If you’re sold on embroidery, and you like using a hoop, you might want to invest in some really good hoops. Hardwicke Manor hoops are made in Germany of birch wood, with brass hardware. The wood is polished super-smooth – no snags, no splinters. They come in three “depths” – thin (5/16″), medium (5/8″) and thick (7/8″). The medium and thick hoops are perfect for heavier fabrics such as linen twill, Mountmellick fabric, and whatnot. The thin hoops are great for fine linen, cotton, etc. I have a variety of these hoops. The first thing I do when I get a new size is wrap the inner ring with twill tape (found in the same section as the bias tape at your local fabric store). Once this rather tedious task is done, my hoops are ready for any project that might come along. Another perk – the hardware on these hoops is really sturdy, and has a screw eye on the bolt, so you can adjust it as tight as you want with a screw driver. These are undoubtedly the best hoops on the market. You can find them locally or online through fine needlework shops who carry goods from Access Commodities. For quick set-up, I like stretcher bar frames, and specifically I love the Evertite Frames. They are great! You can read about them here. For long-term, serious embroidery projects, I use slate frames. They provide the best uniform tension without the chance of damaging the fabric in any way. The drawback to a slate frame is that, if you’re eager to get on to your stitching, you might not like the set-up time. It can take an hour or two to properly set up a project on a slate frame. On the bright side – once it’s done, it’s done! You can read more about slate frames here. You can try Tristan Brooks – they do have them listed on their website. I also like the Millenium Frame, which is a kind of combination scroll frame / slate frame, but it doesn’t require the same set-up as a slate frame. What are your favorite frames and hoops? Feel free to chat about them below! My slate frame is from the Royal school of needlework in England. They have a website and a webshop so you can order from there. It is very sturdy and well made, but it only comes in one size, but that size should do for most projects. A number of years ago I found a japanese square embroidery frame that is very unusual. I think I got it from Lacis, but I have not been able to find another one anywhere. It was supposed to be used for large goldwork projects. The frame can be placed over completed goldwork w/o harming the work. It consists of two SQUARE “hoops” that fit one inside the other. There is about a half inch of clearance between the hoops. This space is filled in by winding the legs of the squares with wide strips of flannel. Then when the larger hoop is pressed over the smaller one, the flannel is compressed and very gently squeezes the fabric taut. I sometimes have to tug a bit on the top bottom and sides to get it really set but it holds beautifully and is so easy to install the fabric. I wanted to add a note about the Royal School of Needlework as a source for slate frames. Their website specifies UK delivery only–not so good for the American in search of that sort of frame. I’ve been looking for a slate frame myself. I figure it shouldn’t be too hard to make (or have one made) but I’m not sure what exactly would be necessary. Above you said “The first thing I do when I get a new size is wrap the inner ring with twill tape (found in the same section as the bias tape at your local fabric store)”. Can you elaborate as to why you do this? Do you tape or glue it, too keep it from coming off? I’ve never heard of this (though I confess to being an advanced beginner when it comes to embroidery). Thanks so much. I really enjoy your website. I don’t go so far as they do in this article to set up the hoop, but I do like the wrap the inner ring for the reasons mentioned above. I use twill tape. I tack it with thread (not glue), stitching the end of the tape (after wrapping) to the beginning. It takes a little bit of time, but once it’s done, you can use it like that all the time. Thanks Mary, that is very helpful. I will buy some twill tape next time I am at the fabric store. mostlytextiles!!! Sorry – I had to remove your post – one of the URLs was so long that it threw off the page. Grip It is by special order only. RSN frames – they come to the US – Perry Iowa each year. If you email the people in Perry they will ship you a frame. I JUST LOVE your site and spend many hours going through all the great comments you have placed here for all of us. I do have a question that I’m hoping you can help with. It is how to order Hardwicke Manor Hoops. I tried the web address which you displayed in your description of these hoops, but cannot seem to open the web site. I’d really appreciate any help you can give me as I cannot find these hoops in my hometown area in Ontario. Thanks so much for being here for all of us to learn and enjoy our crafts even more. I’ll change that link to their home page. I’m also looking for an authentic slate frame. I wish I had gone ahead and purchased one when I was residing in England this past year! Everything is so expensive there, and I thought I would easily find one in the States when we got back. Any update on where to get these? Well, someone mentioned being able to get them through the Royal School of Needlework classes that are held in Perry Iowa. One of these days, I’m going to follow up to see if I can get supplies through them! Do let the rest of us know if you have any luck! This is a British site and they have all different combinations of slate frame rollers and stretchers. If, like me, you want to buy all the various sizes, try breaking up the order to reduce the postage. Otherwise, it’s very expensive. I have received my slate frame order from the above web site. They are made by BWH Designs, a company in Yorkshire. The frames seem well-made and have a nice finish. I especially like the smaller sizes as they should be easily portable. The frames aren’t terribly heavy and I can’t wait to use them! There’s another place here in the States that I recently found them available as well – and I’ve lost the link! Aaack. If I don’t find it again, I’ll bite the bullet and go with stitchdirect. How long did it take for your order to arrive?? Mary, they arrived within a couple of weeks, but a few of the smaller sizes were backordered and took a bit longer. They are quite heavy and fairly large, but really nice. They would be difficult to take out of the house, but worth the investment, I think. They were around $200 last year for both sizes (18″ and 24″). (They cost me around $40 UPS shipping to send them home to Southern California!) The other problem I am going to have with the RSN frames is how to use them. You would definitely need a table to lean them against (or trestles, of course :-). I don’t think my floor stand would be able to handle them; it will most likely fall over. Even the larger sizes from stitchdirect are not as heavy as the frames from RSN. I am especially keen to try out the smaller sizes which I hope will happen in the next week or so. I have just learn that Hometown Perry is closing so RSN will not be coming to the USA this year. I have a slate frame from RSN and a student one from Accomplishments, who noloner imports them. I use trestles from IKEA, they don’t have the leg clearance that the trestles from RSN do, but for $70 they work for me. I have taken several classes in London with RSN and they suggest using a kitchen chair and an adjustible ironing board to hold a slate frame, since most people don’t have trestles. Fabulous discussion this! Slate frames are impossible to find in Australia too, so I am going to check out all the links mentioned. Thanks to all who have contributed information! I have already seen the BWH frames on a couple of sites. Those who have them – you are happy with them? Publishers of quality whitework embroidery books. Is there another source for the Hardwicke Manor frames? The Twining Thread link doesn’t seem to work and I haven’t found the hoops listed under this name at any of the other suppliers on the blog. Also, I’m dying to hear what you found shopping in KC this past weekend! I’ll post my “findings” soon – they aren’t too exciting, but they will get me started on a pending project! 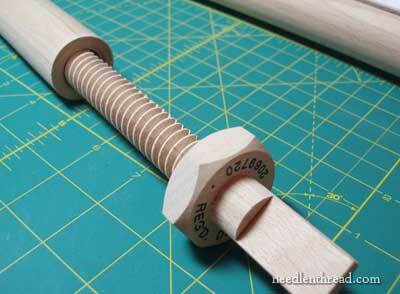 Hi, Nean – I’ve never used the scroll frames with the split dowels, so I’m not exactly sure how to work with those. But I’ll tell you what – I’ll post your question for readers, and you can keep an eye out for comments. They may be able to help you better than I could. But I’ll post your question, and we’ll see if readers can help you out, ok? Nean, there is a product called “stitch clips” that will help keep your fabric taut in a scroll rod. They are kind of like a garter and attach to the side bars and to the fabric. Don’t know if I’m allowed to give links here, but they are available at Nordic Needle. If you do a search there, a few products match, but the one showing a Q-snap is the one you want. I’m willing to bet that will help your problem with the tautness. As for the split rod causing a problem, I would think the only thing that might happen is your ribbon embroidery getting flattened somewhat as you scroll the rods. I’m not too familiar with ribbon embroidery, having only used it sparingly. 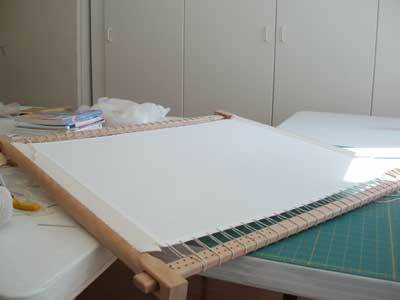 But I do use scroll rods all the time, usually the ones with the velcro fasteners top and bottom. They are a great boon, but you do have to leave extra fabric at the top and bottom, because the velcro tape must be cut off. Hope this helps. The ITA frames I've seen on eBay are scroll frames – haven't seen any slate frames! I've since found a great source for slate frames – Hedgehog Handworks carries a whole range of sizes. I'm not sure, actually. 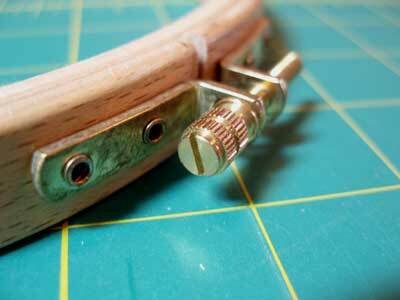 I use the thin hardwicke manor hoops for mine (the 5/16" ones) and they work fine!! ITA make slate frames and all sorts of stands as well as the normal scroll frames. They can all so make frames at sizes to suit the customer. Hi, meimei – I would not use a scroll frame for goldwork, unless the whole design will fit without having to be rolled up. If it has to be rolled up, it could damage the goldwork threads, or displace them. Just my opinion, but no, I wouldn’t…. Have you thought about large stretcher bars? Evertite Frames come in fairly large sizes. my embroidery hoop doesnt widen enough for thick needlepoint. What can I use for a 15 inch pattern so it doesnt warp? Maybe a hoop isnt the solution. I am somewhat of a novice and adore your daily tips and comments. Make sure you square it up as you pin it, then spray it and let it dry, and hopefully, that will take care of it! I am relatively new at embroidery, and am working with linen on a frame I made (using tacks). I shrunk the fabric and put it on the frame, but it is all wavy (if that makes sense). I’m worried my work is going to come out warped. Should I try again? If so, do you have any tips? Hi, Emily – it doesn’t hurt to re-do it, if the fabric is warped. Make sure to tack from the center out on one side, then do the opposite side, working from the center out. Then do the last two opposite sides.